Wow Tag 9 already......Yikes this means Christmas is drawing near real fast. This tag I like, it is simple yet very festive, as you can see I really like the colour green. I distressed the tag using Vintage Photo DI and inked the edges as well. 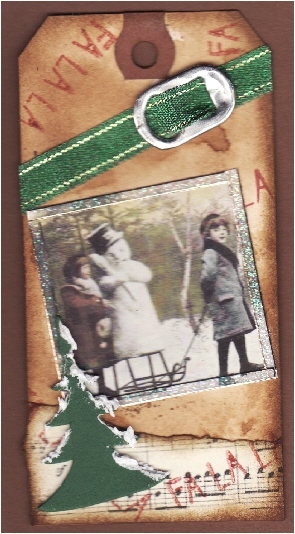 I stamped the background using Studio G holiday Falala stamp in a Rhubarb ink. I tore a bit of music hymnal music and inked the edges as well with VP ink. The tree is a grungeboard from a collection of Tim Holtz, I paitned the tree in green acrylic paint then added a bit of Decoart textured snow. Let dry. I found some green ribbon again in a stash of mine, I am starting to think I am a hoarder, and I took a flip top off of a can and used it as a belt buckle. I had seen this done before and once I did it here I thought that looked kind of cute. The image is free from Flickr and I bordered it with some Starform glittery irridescent peel and stick border. Love that stuff it comes in all colours and widths. That is it my friends. 2 tags today but separate posts so you can keep commenting and another post yet to show you my Inkurable Stampers entry for December. Love this vintage tag, and the way you've used color. The soda can tab is such a cute touch! Very vintage! Very nice! Love the green with the tans/browns and you can't ever go wrong with musical note paper. Thanks for sharing!